Vibraphonist/vocalist Roy Ayers is one of the most celebrated and respected jazz artists and known to many as the Godfather of Neo-soul. In the 60’s he was an award-winning jazz vibraphonist, and transformed into a popular R&B band leader in the 70's/80's. Roy Ayer’s is arguably the most sampled jazz artist of all time alongside James Brown. Many of Ayers' songs including: “Everybody Loves the Sunshine”, ”Searchin,” & “Running Away” have been repeatedly sampled and remixed by producers and DJ’s worldwide! Likewise, Pete Rock is among the most beloved music men in hip-hop. He is loved like a brother by the world’s best-known producers. He has arguably pioneered the fusing of jazz, funk and soul into hip-hop. His blend of jazz, soul and rap music unites people across race, class, gender, nationality and geography. Pete’s sound laid the foundation for how rap songs are structured, how remixes are measured, and how crowds are moved. Pete is equally lauded by musicians and recording artists. Pete was brought into the rap game by the late great Heavy D, his cousin. His bond with CL Smooth gave the world three classic albums: All Souled Out, Mecca & The Soul Brother and The Main Ingredient. He has joined musical forces and toured with legends as different from one another as Roy Ayers and DJ Premier. As producer, he has recorded several albums that expand and deepen the mosaic of hip-hop music, confirming him as an artist in his own right and solidifying him as a global treasure to lovers of modern Black music worldwide. When Pete Rock was first asked to perform in a tribute for Roy Ayers backed by Robert Glasper in 2009 he was beyond honored. They tore down the house in NYC and it was here they met for the very first time at this Roy Ayers tribute performance. The exchange and dialogue between each other regarding music history and its continuum was quite remarkable to watch. In the summer of 2011 the duo decided to tour Europe together performing jazz, soul and hip-hop in venues like London’s famed Jazz Café to Rotterdam’s beloved North Sea Jazz Festival. 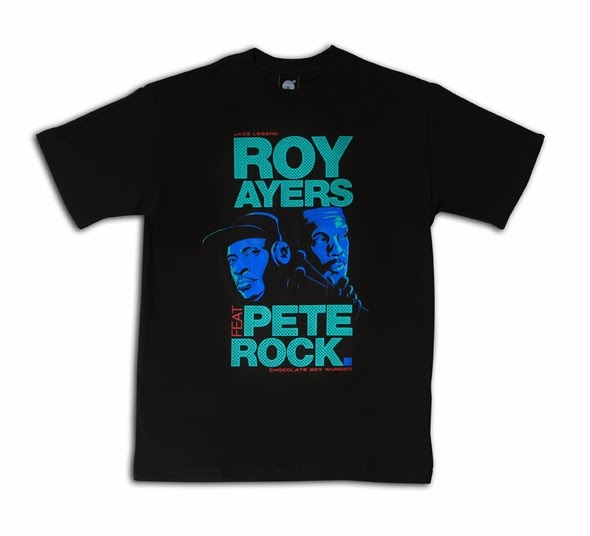 In support of their touring efforts the Roy Ayers & Pete Rock tee was born. In honor of Black History Month, we pay homage to these two musical gods. Click here for Pete Rock’s Roy Ayer’s Tribute Mixtape.